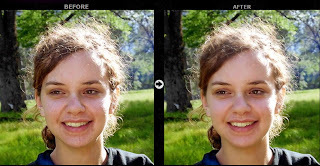 Pink Mirror is an online image editor that can helps you remove blemishes, spots, acne marks for your portraits. It is a simple tool, just upload your portrait (only for facial photo), fill your email ID and click "Pink Mirror" button. It will display before and after make over photos on screen. But I do not know why it need our email address.